We're bringing country dancing to the historic opera house! All ages and skill levels welcome. 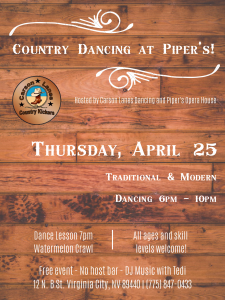 Dancing is from 6 P.M. - 10 P.M. with a line dance lesson for Watermelon Crawl at 7 P.M. This is a FREE event!